The Impossible Burger, seen here at Stella’s Bar & Grill in Bellevue, Nebraska. According to the Times report, some ranchers and farmers (as well as lobbyists paid by their industry) are worried that plant-based meat substitutes—an industry that is growing by double digits each year and is rapidly getting better at producing tastier products—will threaten their bottom line. They seem particularly worried about losing control of labeling, like the dairy industry failed to anticipate the rise of almond and soy milk, as well as the potential impact of hypothetical future cheap, lab-grown meat on their businesses. 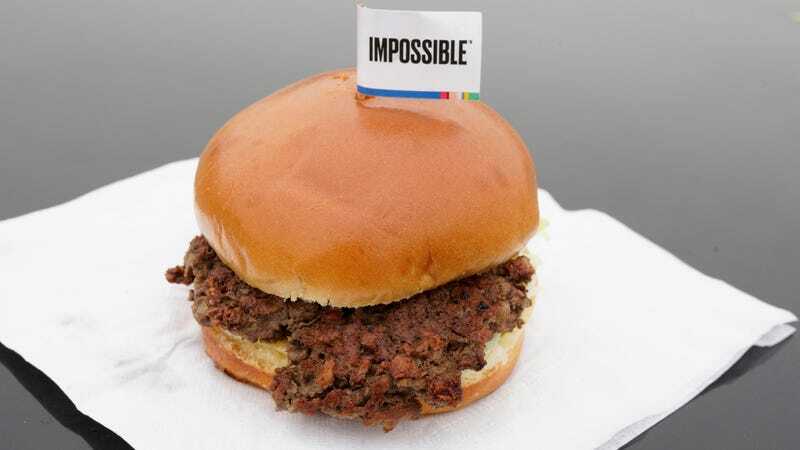 That’s despite lab-grown meat still not being out on the general market, and almost certainly remaining quite expensive for the foreseeable future. ...“Almonds don’t produce milk,” said Bill Pigott, a Republican state representative in Mississippi who wrote the legislation there. He owns a farm that has produced both dairy and beef. But his worries have gone beyond almond and soy liquid’s being labeled milk. However, early indications are that the cattlemen may be facing a tough fight. A bill in Virginia was shot down after major backlash from the National Grocers Association, the Grocery Manufacturers Association and the Plant Based Foods Association, the Times wrote. According to Virginia Mercury, despite being backed by the “Virginia Cattlemen’s Association, the Farm Bureau, and pretty much every other farm-group in the state,” the legislation was unanimously voted down in committee. Another bill in Washington that would outlaw the sale of lab-grown meat, as well as restrict state funds “from being used for research in the area,” has not come to a vote, the Times wrote. There is also an ongoing effort to pass a law in Nebraska, where State Senator Carol Blood has introduced a bill that would amend the state’s deceptive trade practices statutes. “I don’t care that it says burger—I care that it says it’s meat,” Blood told the Times. One successful effort was nonetheless mounted in Missouri, which passed a law defining meat as “derived from harvested production livestock or poultry” and prohibiting labels with terms like “ground beef style” with “overwhelming bipartisan support,” according to NPR. But it is facing a lawsuit from Tofurky, the Good Food Institute, the American Civil Liberties Union of Missouri, and the Animal Legal Defense Fund, which claim that it violates the First Amendment, makes labels more confusing, and was passed to suppress competition and protect animal agriculture. The Food and Drug Administration has also teamed up with the Department of Agriculture (USDA) to jointly develop regulations for “cultured meat products,” referring to lab-grown meat, but have yet to release anything. As the Washington Post noted, it is unclear what the agencies will decide, including on labeling. But the outcome of those regulations could pre-empt many of the state laws under consideration, according to the Times. The Times wrote that many of the biggest firms in the meat business, like Tyson and Cargill, have also invested in lab-grown meat startups, and the North American Meat Association has also said such products should be called meat to ensure they cannot dodge regulatory compliance. According to NBC News, concern from ranchers and the like isn’t necessarily shared by those bigger firms, which in addition to their dabbling in the lab-grown meat business receive massive subsidies to keep their products flowing to customers. The meat industry spent $6.52 million lobbying in 2018, NBC wrote, and it’s unlikely that the government will stop encouraging consumption of beef or other meats anytime in the foreseeable future. According to NPR, the USDA projected that 2018 would see the U.S. shatter its previous record for meat consumption in 2004. “Senators have a great deal of power and the beef industry has an enormous amount of lobbying power, because they are in every state,” former New York University nutrition professor Marion Nestle told NBC News, adding that the industry has prevented other criticisms like the environmental impact and questionable sustainability of factory farming from translating into policy. In 2015, the beef industry “went straight to Congress,” where a group of Republican senators “instructed the secretary of agriculture not to have sustainability in the dietary guidelines,” Nestle added.